MBN Corporation ("MBN" or the "Company") is managed by Middlefield Limited, which is a member of the Middlefield Group. The company's principal objective is to create long-term value through a dual track strategy of: (i) growing MBN's assets under management through mergers with other investment funds; and (ii) pursuing opportunities with the broader financial services sector. MBN's management team includes experienced and successful individuals who have committed their own capital to the Company. 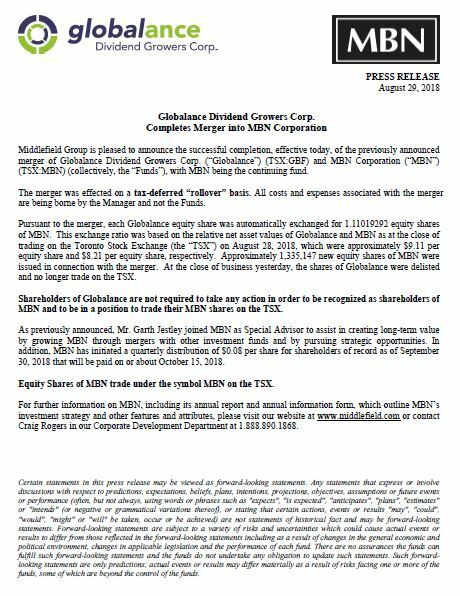 MBN's shares are listed on the Toronto Stock Exchange under the symbol "MBN".